Catch some sleep between flights -- without drooling on the guy next to you. The legions of airline passengers stranded around the world several months back, victims of Volcanogate 2010, shone the floodlights on one seemingly inevitable fact of airports: They make for terrible hotels. That’s about to change, if Dream and Fly has its way. The Barcelona-based design group has an idea to fit-out airports everywhere in small, designy “luxury rooms” -- think the Standard hard by Connections Bar & Grill. Called “Bubbles,” they're fully equipped with beds, bathrooms, and tons of places to plug in laptops and the like (another seemingly inevitable fact of airports: they never have enough outlets). They come in three sizes; the largest, at 108 square feet, has a bed, a baby cot, and a bathroom. You rent them at a kiosk or online, and the rate is hourly. “Each Bubble has an astonishingly practical configuration, [and is] individually designed and built with attractive materials, offering great sleeping comfort and a unique experience,” Dream and Fly’s Cédric Michiels Chalamont tells us in an email. It might sound weird at first -- only a crazy person would want to sleep at an airport. But because of strict security regulations, people are spending more time than ever at airports, and airports have adapted by turning themselves into little cities, with decent restaurants, bars, and way too many stores. Why not add sleeping accommodations to the mix? It’d be perfect for passengers with long layovers who want to catch some shuteye but don’t want to pass out on a chair. It’d also be great for people with canceled flights. Instead of wasting money on a cab to some crappy airport hotel, they could fetch up in a pod. Imagine how many people these things could have helped last April. Obviously, there are details to hammer out. How do you keep them clean? How do you make sure they don't turn into vessels for hot, airport hanky panky? And even if they are practical, will people actually use them? Or will they become like airport luggage carts, the exclusive realm of old people and families with too many children? Maybe we’re just not used to anything good coming out of places you rent by the hour. COMMENTARY: Mobile sleeping hotels and sleeping pods are the latest trend. Japan has a hotel chain that offers sleeping pods similar to Dream and Fly's Bubbles. Not good if you are claustrophobic. They are about $60 a night, which compared to traditional hotels are considered a real bargain. 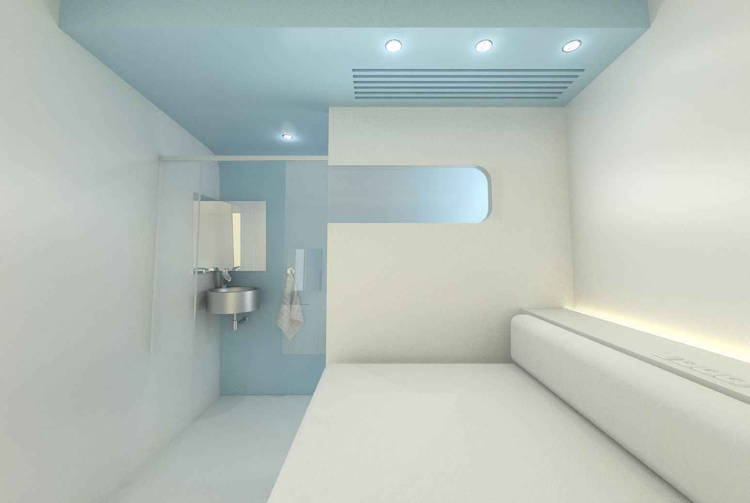 Simple Bubble - The Simple Bubble of 5 m² size ﻿is destined for individual occupancy and perfect for powernaps and a rest while waiting for the flight.﻿ It is not equiped with a bathroom and shower. 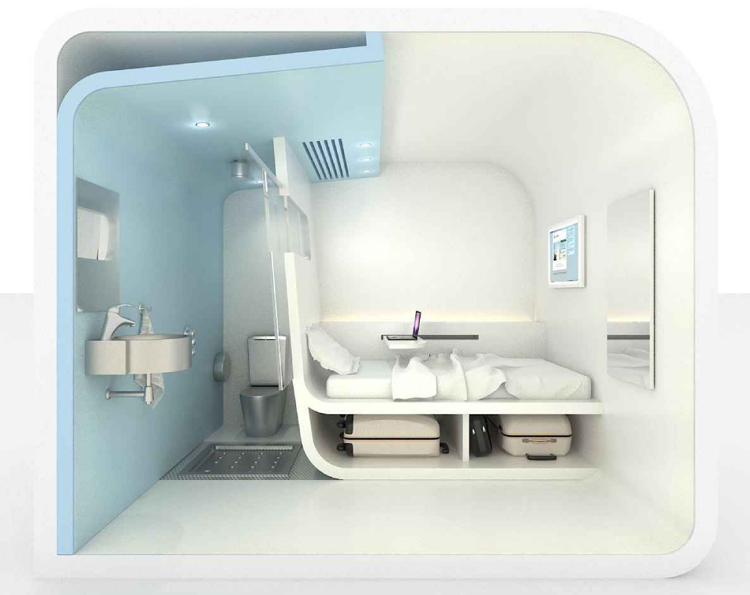 The Simple bubble is aimed at young budget travelers looking for a fancy room with basic technology and a bed to rest. The plug and use solution ensures that the Simple Bubble can be installed both inside of existing building or in private areas in the exterior. Single Bubble - The Single Bubble of 7 m² size is equipped with a bathroom and rain shower. It is destined for an individual occupancy with full privacy, entertainment, comfort and connectivity. The Single Bubble is aimed at wide range of transiting travellers in aiport terminals heading for early flights, transfer flights or with cancelled flights. 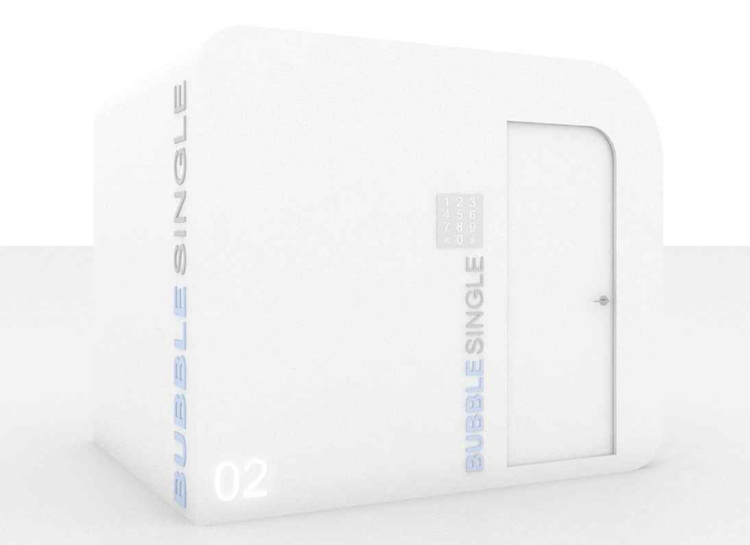 The plug and use solution of the Single Bubble can be installed both inside of the existing building or in the private area in the exterior. Double Family Bubble - The Double Bubble of 10 m² size is equipped with fully functional bathroom and shower. It is destined for tripple family occupancy (parents and one babby) and is perfect for comfortable private space for the family to rest and freshen up while waiting for their flight. A series of different Bubbles can be combined to form a "micro-hotel" or may function independently. Booking of each Bubble is done online and onsite or through vouchers. A micro-kiosk is installed outside the entrance of every Bubble in order to make bookings and access the Bubble easily and safely by clients. Pre-implementation advisory services - Feasibility study for a potential hotel investor/operator. Implementation advisory services - Setup turnkey micro hotel system according to D&F business model. Assembly and installation of Bubble pods, reservation kiosk and PMS software. Post-implementation brand management - Dream & Fly branding, distribution channel management and online marketing. PMS software for managing reservations of Bubble pods. D&F does not take part in the operational management of the concept that they supply. They promote the concept and its brand on a marketing level which is reflected in a commission derived from unit sales and monthly licensing fee for our software. Services and business model is compatible with our client needs. It is important to take into account that the prices will depend on which type of Bubbles you require and its quantity + complementary options. D&F will quote prices in EUROS. Unit prices for Bubble pods depend on the quantity and type of Bubble pod ordered. Unit prices are quoted for less than 50 units, and for 50 units and up depending on the type of Bubble pod. Assembly costs per Bubble pod are extra and range between 2,000 and 3,100 EUROS per pod depending on the type of Bubble pod ordered. Shipping, customs duty and fees. Sanitary, fixtures, fittings, check-in kiosk, D&F dynamic PMS software, security access code system and domotic system. Micro-hotel architectural, building costs, facilities management, facility operations, legal, other consulting, and local licenses and permits. 15 - 50 Bubble pods. D & F dynamic PMS software.